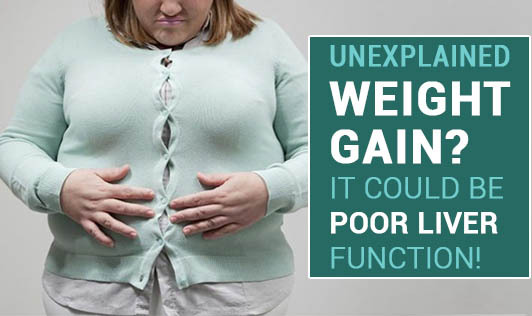 Unexplained Weight Gain? It Could Be Poor Liver Function! Weight management is the most difficult task for most of us. Every year we make resolutions to eat right and stay fit. We struggle to fight weight issues and degenerative conditions like high blood pressure, cholesterol, diabetes etc. An extremely important aspect of weight loss is liver function. Most of our diets see-saw among a mix of high-fat processed foods, nutritionally deficient food and crash diets, all of which contribute to weight gain. As a result of all these constant changes, the liver becomes sluggish and starts accumulating more fat every day. It is the chief blood detoxifier. It is the primary fat metabolizer. Once the liver starts accumulating fat instead of metabolizing it, it becomes sluggish making weight loss further more difficult. Let us find out the causes for a ‘Fatty Liver'. Fat concentrated foods (Primarily animal fat): Animal fats release certain toxins on digestion that can affect the normal functioning of the liver. Sugar concentrated foods: A sugar load in the body can cause insulin resistance causing high blood sugar levels, and simultaneously convert the sugar into fat. Artificial sweeteners: They bypass the normal digestive stages and directly reach the liver. These products tend to shut down the metabolism of fats in the liver. The fats in the liver are partially digested and released into the blood or stored as unprocessed material in the liver. Excessive alcohol intake: It is the primary cause of fatty liver and further contributes to cirrhosis if left untreated. Over the counter medicines: Certain medications commonly used can have adverse effects on liver function. Check with your health care practitioner for safe medicines before reaching out for over the counter medications. Unclog your liver and ease your weight loss to meet your health goals!